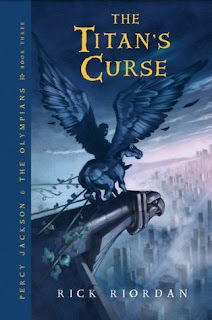 Other: Third book in the Percy Jackson and the Olympians series. All five books have been published. In the third book of the Percy Jackson and the Olympians series, we meet Percy again. Grover has found two new heroes and it's up to Percy and his friends to bring them to safety. On top of that all, the Oracle speaks out another quest, that will have to obstruct dark powers from rising. It's hard not to talk to prevent spoilers, but I'll do my best. In this book, we follow Percy again and Percy is getting older, although sometimes he doesn't seem to get any smarter with the experiences he has now (the boar, anyone?). We see some new characters and I just have to say that my hunch was right after reading The Sea of Monsters! In The Titan's Curse, we meet even more mythological characters and Rick Riordan has done a phenomenal job in describing them and teaching the reader about them if you don't already know them. I only know the myths of the gods and creatures that Riordan has written about in The Lightning Thief and The Sea of Monsters, but I could immediately see them before me. Riordan describes a little background with most of the new characters, because Percy doesn't really understand them either, sometimes, so the reader knows what they are reading about. This book was funny, fast paced, packed with gods, goddesses and other mythological beings and overall it was a pretty darn awesome read. I la-la-loved reading this book and I have to restrain myself from reading the entire series all at once. I don't want to rush it! Five fully deserved stars for The Titan's Curse! It's my favorite book in the series so far and I can't WAIT until I see what Riordan has in store for us for The Battle of the Labyrinth.